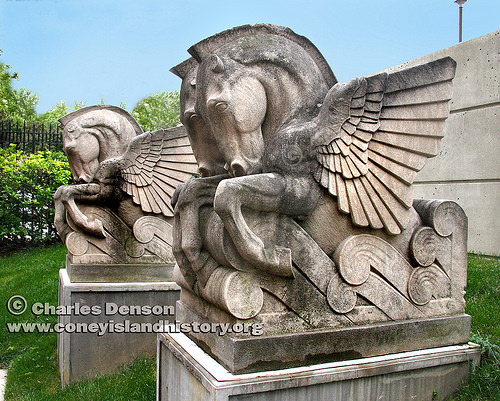 Let’s bring the Pegasus statues home to Coney Island! The only way that can happen is if the long vacant Coney Island Pumping Station, which they once guarded, is landmarked and restored. Today, October 22nd, is the last day to submit your comments to the City’s Landmarks Preservation Commission in support of landmarking the 1938 art moderne gem. The email address is backlog95@lpc.nyc.gov. “Anytime is fine,” Emily Rich, the LPC’s Public Information Officer told ATZ, so make sure to email your message before midnight. If the city-owned building on Coney Island Creek wins designation, it would become Coney Island’s only official landmark outside of the amusement area, which has six official city landmarks–The Wonder Wheel, Cyclone and Parachute Jump, the two former Childs Restaurant buildings, and the former Shore Theater.